Were Neanderthals Religious? : 13.7: Cosmos And Culture December is full of sacred holidays for many — and meaning-making through social gatherings and rituals for others. Anthropologist Barbara J. King considers how far back religious practices might go. Imagine this scene: Inside a cave in Spain, a group of people gather around the grave of a toddler. Hearths with lit fires, marked by 30 horns of animals including bison and red deer, surround the grave. A rhinoceros skull is nearby. At a conference this fall, archaeologist Enrique Baquedano and his colleagues described this scene as a probable funeral ritual held 40,000 years ago by Neanderthals. That announcement contains a mix of both hard data — the child's bones and the animal horns and skull — and informed speculation suggesting that these data point to a community funeral ritual. The archaeologists' scenario relates closely to questions I have been thinking about: Did the Neanderthals practice religion? How would we know it, if they did? Let's approach these questions by placing Neanderthals in evolutionary context. It's now clear that Neanderthals are our cousins, not our direct ancestors or early members of our own species Homo sapiens. Known formally as Homo neandertalensis, Neanderthals lived in Europe and Asia, overlapping in certain places at certain time periods with Homo sapiens — and almost certainly interbreeding with them (with us!) on occasion. Even though populations of Neanderthals vanished around 40,000 years ago, genes of Neanderthals do live on today, tucked into the bodies of some of us and potentially affecting our health. For much of the time since their initial discovery in the 19th century, Neanderthals have been cast as enduring symbols of dumb, brutish cave people. We know better now, though. Neanderthals built complex structures, captured birds to ornament themselves with feathers, and successfully hunted mammoth and other formidable megafauna with tools. But does any of the evidence suggest that they were religious? It's notably tricky to infer religious behavior from material culture, as I've written about here before regarding Gobekli Tepe, a possible 11,000-year-old modern-human temple. We do see hints of ceremonial responses to the dead at Neanderthal sites other than the Spanish cave. At Teshik-Tash in Uzbekistan, a Neanderthal child was buried and encircled by goat horns. At Regourdou in France, bear bones, plus a slab of rock topped by tools and another bear bone, were placed at a Neanderthal body positioned at the bottom of a depression. Bear bones in an adjacent room at Regourdou suggest to some archaeologists that bear meat might have been consumed there as a funeral rite. Skeptics like archaeologist Rob Gargett point out both formally and informally that natural (or taphonomic) explanations may suffice to explain some of these occurrences: In other words, it may not be Neanderthal agency that we're seeing at all. Looking at the evidence collectively, though, I think at least this conservative conclusion is warranted: Some Neanderthals buried their dead with purpose and care. Next comes our central question: Did Neanderthals engage in some way with the supernatural or the sacred? Caution is required here. The bones and artifacts, after all, don't clue us in to the meaning-making that went on in Neanderthal groups, and we can't just overlay present customs onto the past. Perhaps the Neanderthals simply wanted to bury their companions' bodies in order to protect themselves from predators, or disease, or both. But, then, why mark the burials as elaborately as the Neanderthals have done in some places? Maybe the symbolic marking was the Neanderthals' way of showing respect and care for people they had known and loved in their lives. Either or both of these explanations may be wholly adequate to explain the evidence. 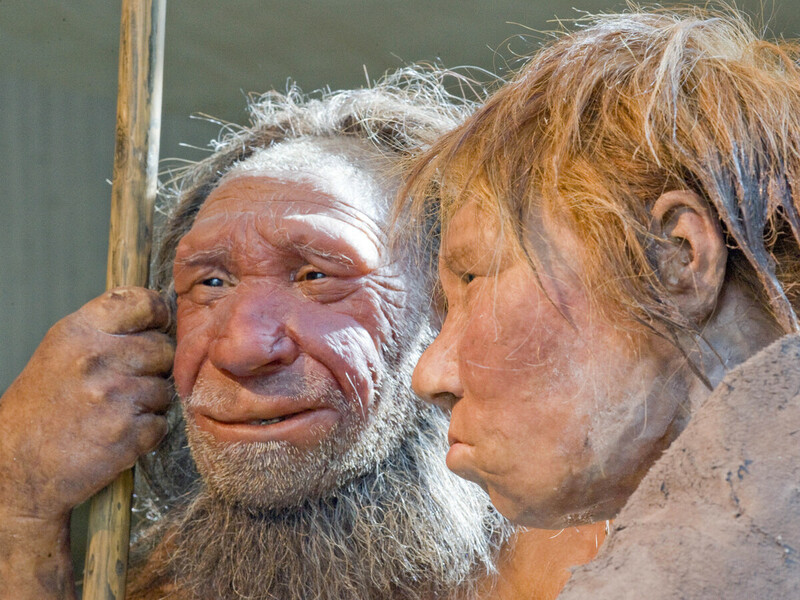 Given their intelligence, it seems to me likely that the Neanderthals contemplated, in some way, the mysteries of life. Wouldn't they have wondered not only about unexpected and surprising weather events and sky events but also what happens when our lives comes to an end? If they thought about these questions, did they do so with awe, dread or reverence? More relevantly for a scientific analysis is this question: Did they come together in groups to evoke gods, spirits or ancestors to help themselves make sense of the world? I emailed anthropologist and Neanderthal expert John Hawks at the University of Wisconsin to ask for his thoughts about Neanderthals and religion. "Religion, as many people recognize it, is built from highly detailed symbolic narratives. If we separate that out, though, and look only at the material manifestations that an archaeologist might find, there is really very little in most religious traditions that is different from what Neanderthals do. "So I don't think it is at all improbable that the Neanderthals had a humanlike religious capacity. But to be honest, I think this is not what many Americans or Europeans would recognize as religion." Hawks' basic idea fits with my own: Religion is best understood across cultures and time periods as practice rather than only belief. Some religions, of course, feature sacred texts in which a set of beliefs is set forth. In these cases, what you believe about a god or other sacred forces may really matter. In many human societies past and present, though, no text exists, just everyday life — appeasing gods or spirits, honoring the ancestors — that is shot through with a sense of the sacred or the supernatural. It's within this context that the case for Neanderthal religion — for ritual practices steeped in connecting to the sacred world — is most convincingly made. It's no accident that I'm writing about this topic in December. It's a month that, for many people, includes sacred holiday celebrations. Even for those of us who aren't religious, it's a time of the year packed with meaning-making through social gatherings and rituals. How fascinating it is to take seriously the idea that the deep roots of human meaning-making ritual, and even of religiosity, may go as far back as the time of the Neanderthals.